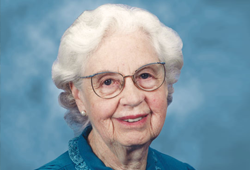 During her lifetime Elsie May Miller had a tremendous impact on future generations as an elementary school teacher of 30 years and donor at Saddleback Memorial Medical Center. When this dear lady passed away last year, her bequest to Saddleback Memorial ensured that she continues to make her community a better, healthier place for current and future generations. Elsie began donating to Saddleback Memorial Foundation in the 1980s and was an active member of the Associates, often seen attending fashion show fundraisers. The longtime Laguna Woods resident contributed to cardiology, cancer, hospice and women & children's services as well as the Critical Care Pavilion. Elsie's bequest will help fund the Designed for Healing enhancement project currently underway at the medical center. In gratitude of her generous gift, a nursing unit will be named in her honor. "Elsie understood that without a valid will or trust at death, those assets would have been distributed according to state law," notes Saddleback Memorial Foundation president Cecilia Belew. "We are fortunate that Elsie included Saddleback Memorial in her will, benefiting patients and their families for generations to come. Janet Zahl, Elsie's goddaughter and estate trustee, remembers Elsie as "sweet, caring, humble and godly." Janet adds, "Elsie really enjoyed being involved with Saddleback Memorial. She knew that they take good care of everyone and it's a wonderful place to go if you need care."